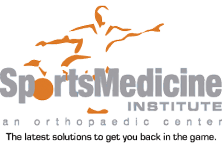 This website is operated by Healthcare Success Strategies on behalf of Sports Medicine Institute, content has been reviewed and approved by representatives of Sports Medicine Institute, who assume all responsibility for the accuracy of information contained herein. The use of any information you provide is governed by an Agreement for Marketing Services between Sports Medicine Institute and Healthcare Success Strategies. This agreement provides for appropriate safeguards and protections outlined by HIPAA to insure the safety of your personal health information. The only use of this PHI is to pass it along to Sports Medicine Institute for follow-up and contact, and to maintain archived copies at Healthcare Success Strategies or selectively approved service providers for purposes of measurement and back-up. We may combine your personally-identifying information, and information about your preferences and activities, with those of all or a particular group of our users to prepare collective profiles of our users and their activities. For example, we may track the number of our users who view certain pages or use certain features or compile the total dollar amount of sales conducted through this site in a particular geographic region. Such information, and other information we derive from individual users’ information, allows us to continue to grow and provide you with quality fellow users through more accurate marketing and advertising of our website. At any time after you have logged on to our site, you may contact us at info@healthcaresuccess.com to request access to information we have collected regarding you or to notify us of changes to such information. If you request any such changes, we will contact you by email or fax to confirm those changes. Once confirmed, any new item of information will replace the corresponding information previously provided. It may be necessary from time to time for us to modify this policy to reflect changes in the way we collect and use information or changes in privacy-related laws, regulations, and industry standards. Accordingly, we reserve the right to change this policy at any time by posting the revised policy on this website. This policy was posted on August 13, 2013. Data will be handled in accordance with the policy in effect.